Sample apps are intended to demonstrate basic functionality of common Enterprise Browser APIs and show how to integrate API code into an HTML page. Apps are fully functional only when launched using Enterprise Browser, but their layouts can be viewed from the desktop. Use of the sample apps requires a basic understanding of Enterprise Browser and its Config.xml runtime configuration file. See the Config Editor Utility guide for more information. To learn EB basics, see the About page. Also see the EB Feature Demo app. The Adaptive Printer Driver (APD) is supported on Android and Windows Mobile/CE devices. Printing an image requires a file called image.png to be located on the device. Printing images on a Windows Mobile/CE device requires the sample code to be modified. The ebapi-modules.js file is required for Enterprise Browser 1.x APIs to function on Android and Windows Mobile/CE devices. The elements.js file is required for Pocket Browser and RhoElements APIs to function on Android devices. See the Accessing the Code section (below) for more information about placement of API module files. APIs for EB 1.x are sometimes referred to as "Common" APIs. Tapping on a sample app (from a desktop browser) using one of the links below will display the app's layout and controls but its API will be inoperative. To see how the API works, it must be opened from within Enterprise Browser. This can be done either by using EB to navigate to the page's URL, or setting the URL as EB's start page (through the <StartPage> parameter in the Config.xml file). The latter process is explained below. Identify the sample app and API on the platform of interest. Right-click on its link and select "Copy Link Address." Paste the link into the <StartPage> parameter of the Config.xml file. Push the updated config.xml file to the device. Launch Enterprise Browser and test the sample app. Demonstrates how to use the Barcode or Scanner API to enumerate all the scanning devices currently attached to the device and to scan a barcode and fetch the decoded data via callback. 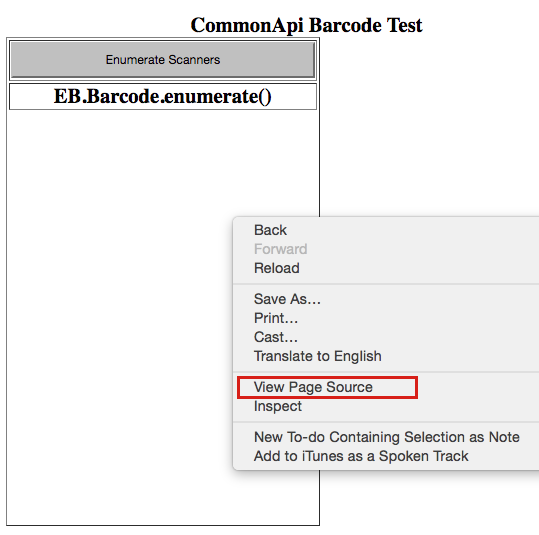 Enterprise Browser uses the Barcode API. The corresponding API for Pocket Browser and RhoElements is called Scanner. Demonstrates how to use the Battery API to retrieve battery status and show/hide the battery icon. Demonstrates how to use the Camera or Imager API to take a picture. Demonstrates how to use the EzNFC API to enable/disable the NFC Adapter and read NFC Tags. This API is available for only Android devices. Demonstrates how to use the Intent API to send an Intent and how to receive an Intent via Broadcast receiver. 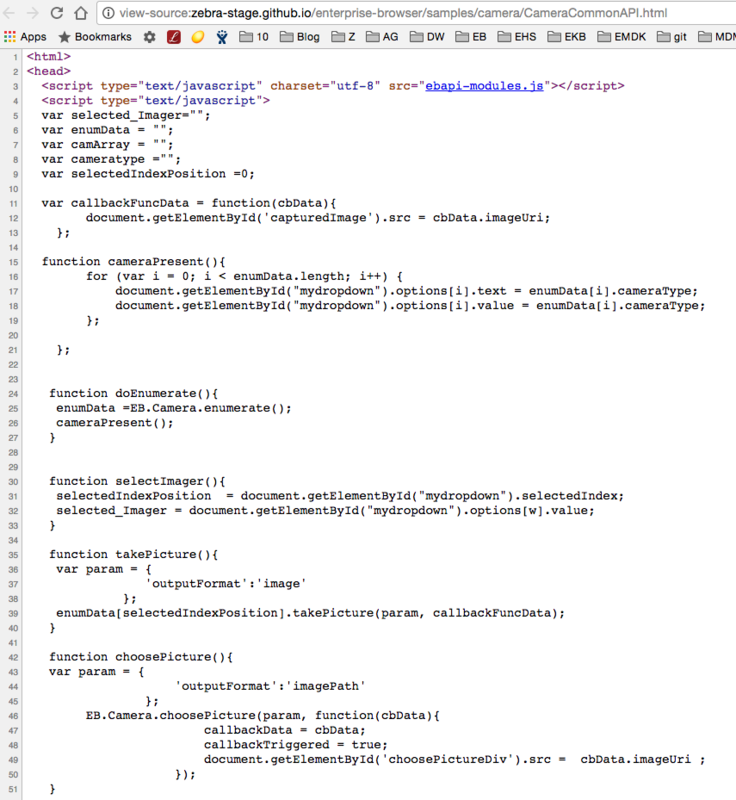 This sample code is intended for Android devices only but will operate on Windows Mobile/CE devices with modification. Demonstrates how to use the KeyCapture API to capture and remap keys. Demonstrates how to use the EB 1.x Printer API to find a printer and output text or images via Bluetooth, USB and Wi-Fi on Enterprise Browser for Android only. The APD API works to print a text string with or without a label with EB, PB and RE on Android devices and with EB on Windows Mobile/CE devices. Printing an image from a Windows Mobile/CE device requires modifications to this sample code. Note: Printing an image from an Android device requires a file called image.png to be stored in /<internalstorage>/sdcard0/Pictures/ on the device. Demonstrates how to use the Signal or SignalIndicators API to retrieve the signal status and to show/hide the signal icon. Enterprise Browser uses the SignalIndicators API. The corresponding API for Pocket Browser and RhoElements is called Signal. Demonstrates how to use the Signature or SignatureCapture API to capture, show, hide and clear a signature. Enterprise Browser uses the Signature API. The corresponding API for Pocket Browser and RhoElements is called SignatureCapture. 1. Using a desktop browser, click the link for the sample app and API on the platform of interest. 2. Depending on the browser, right-click and select View Page Source or use the browser's View or Tools menu to find the corresponding command to expose the source: Chrome and Firefox offer a "View Page Source" right-click option. In Firefox, select Tools -> Web Developer -> Page Source. If Enterprise Browser APIs are used, these API files must be present on the device and referenced within the HTML of any page that uses them. See the API Usage Guide and individual API pages for details.